Please click one of the links below to view that section for the route on Everest Nepal, or scroll down. Everest is perhaps the most coveted mountain in the world. The south (Nepalese) side is the route first climbed by Tenzing and Hillary in 1953, and the dates we have chosen feature the best weather of the year. Our proposed schedule allows for two potential summit attempts. This expedition to Everest maximizes many years of accumulated wisdom of the high Himalaya, a strong record of reaching Everest, K2, Kangchenjunga, and many other 8,000 metre summits, along with an intimate knowledge of the Nepalese officials who regulate the permit system. We must also give credit to the highly experienced and hard-working climbing sherpas, cooking and office staff. The proposed itinerary allows enough time for proper acclimatization, rest days, and several returns to base camp, where the kitchen and base camp staff can look after all of your needs, and quell your appetite. The weather at this time of year is normally quite good and stable. However, we all know the global weather is changing, and in case of storms, you will note the proposed itinerary includes extra days as well. In previous expeditions, half of those who reached the summit needed every single "extra" day. Early the following morning we fly to Lukla at 2,850 metres/9,400 feet., where we meet our yak drivers, and porters. If there is time, we will trek to Monjo (2,650 metres/8,700 feet), and spend the night. For our full-service members, the cost of this expedition includes one of the most beautiful treks in the world. For more information and photos, please visit our Everest trek section of the site: Everest Trek. Trekking in the Khumbu valley. Yaks carry our gear (Bob Rowe). Crossing a bridge under rhododendron forests. (DL Mazur) Our team in basecamp (DL Mazur). We will continue our trek up to Namche Bazaar (3,450 metres/11,300 feet), the capital of the Sherpa Kingdom. Here we rest for a day to acclimate, then proceed up to Deboche (3,750 metres/12,300 feet) for a night, then to Lobuche (4,950 metres/16,200 feet), where we have another acclimatization day. Finally, we make the last trek to basecamp at 5,300 metres/17,400 feet. Climbing at 8,400 metres/27,600 feet above the Kangshung Face (DL Mazur). Through the following weeks, we will climb up and down the mountain, exploring the route, establishing camps, and carefully and safely building our acclimatization level. From camp 1 at 6,000 metres/19,700 feet, the route traverses the flattish bottom of the Western Cwm, to 6,200 metres/20,300 feet where camp 2 is located. 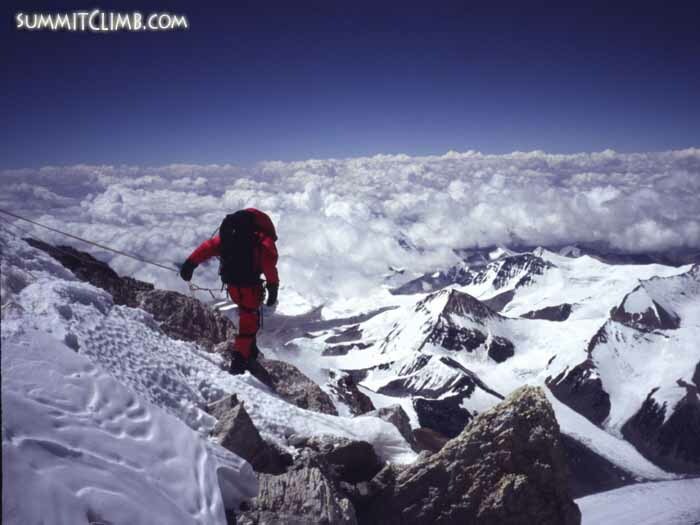 The South Col, camp 4, is the highest camp and at 8,000 metres/26,200 feet, it is a windy and cold place. We take our time, climbing up and down to acclimate, which gives us the best chance to ascend in safety and maximize our opportunity to reach the summit during the "weather windows" which generally open in May. There are typically snow on the ledges to walk down on, interspersed with rock, along with some fixed rope. There’s a little short slope on reliable snow which leads to the top of the Geneva Spur. The route turns hard to the left onto the snowfield that leads to the top of the Yellow Bands. The route to the summit winds through snow ice and rock fields, at a 10 to 50 degree angle. These slopes are not considered technical, but there is exposed rock here in the spring, and lines are often fixed. Fixed rope is often placed on the small vertical pitch of the 12 metre/40 foot, high Hillary step, and the summit lies directly above. The summit sits at the top of the world. Looking up at the summit from the south col. Climbing at 8,400 metres/27.600 feet, above the Kangshung Face. Approaching the Hillary Step. Climbing on the Hillary Step (DL Mazur) . The view from the summit, looking west to Cho Oyu, Shishapangma, Pumori, and many others (DL Mazur) . From the summit, you will cross over and ascend the other side of Mt. Everest where camps will already be established from our Tibet expedition. For more about the route coming down from the summit on the Tibet route, please click here. For more about the cost of doing the traverse from Nepal to Tibet, please click here. Descending the fixed lines below the summit on the Tibet side (Ryan Waters). Thank You for joining our Everest Nepal Expedition.